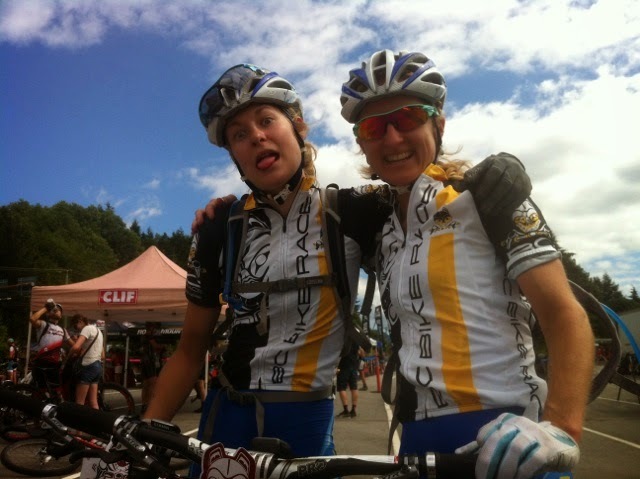 Luna teammate, Maghalie Rochette and I just wrapped up a week of racing at the BC Bike Race (BCBR). 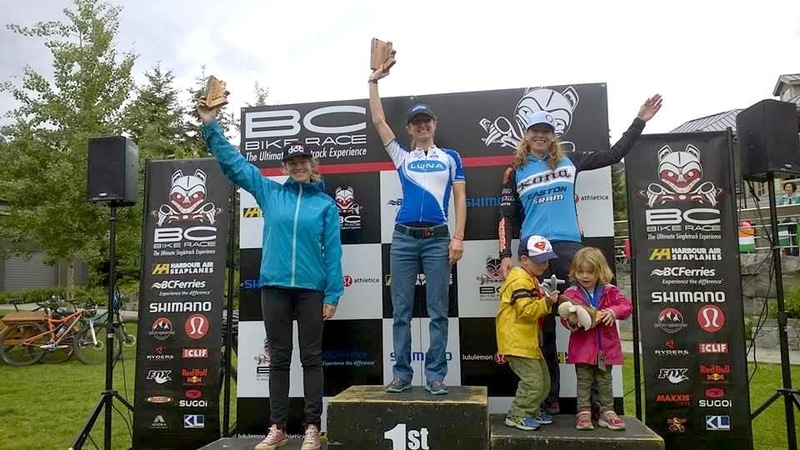 It was my third time doing this awesome event where we race hours of the best BC single track every day for a week. 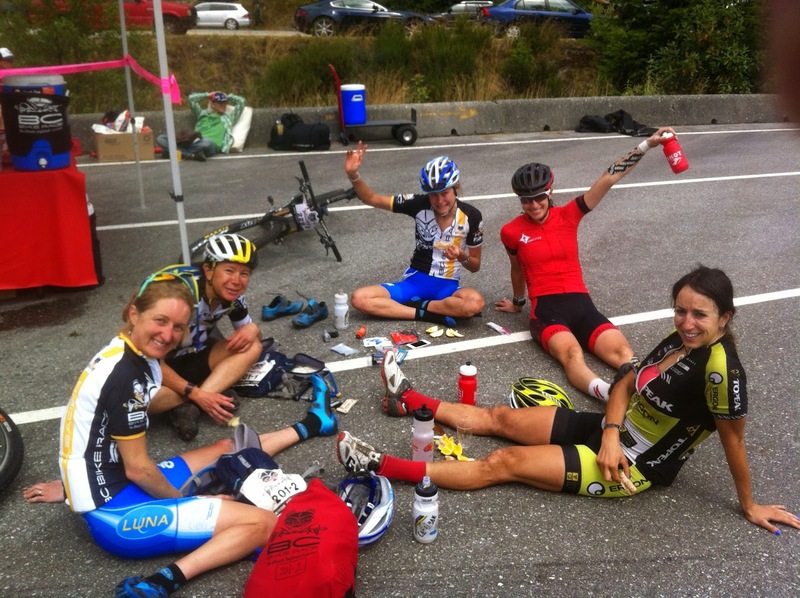 The first time I did BCBR, it was with my teammate Katerina Nash. We were evenly paired in fitness and technical skill and raced our buts off for 7 days straight to stay ahead of Lea Davison and Alison Sydor. In 2010, we had a bit of a “Dream team” in the mixed category as I paired up with my Olympic teammate Geoff Kabush. Rather than having to share the load on the fire roads, I sat in his comfortable draft and did my best everywhere else to give him some good training. This year, I was the stronger teammate physically and technically. I would be domestique trying to get my protected rider from point A to point B as quickly as possible, but also at a rate that she would be able to complete the week…. And at a rate that wouldn’t have her throwing death glares my way! A photo to remember how hard you can dig! Each pairing was an amazing and totally different experience. For Maghalie, it would be her first time doing a stage race. Like me in 2009 she was wondering if she would be able to go race pace for 2-3.5 hrs every day for 7 days. That is a pretty intimidating idea to someone at any level let alone someone in their 2nd year of mtn bike racing after a youth spent in triathlon. But Maghalie impressed us both getting stronger as the week progressed. Here’s a brief note on each day…well as brief as I get and I am still leaving out so much! Day 1: North Shore Vancouver. The gnarliest stage and earliest wake up! Having gotten to bed at midnight after flying in from the US cup in Colorado I was a little bagged. Despite the fact that this was a stage race, the pace from the gun was like any high-level mtb race start. Maghs did an awesome job and we were with all the top solos women into the first single track. The slick rocks and roots threw me off a bit after Colorado’s dry and loose but Magh’s was on fire …until her handlebar hooked a bridge railing and sent her flying. Like any bad crash it took a while to shake it off, but an easier day for me was probably a good thing. We still put out a solid ride, railed the enduro and got into the spirit of BCBR with all the awesome costumed fans out on course. Having so many people out on course means there is some traffic to negotiate. After pulling off to the side of the trail for me to pass, a guy swung back into the trail and I was sent flying. I hyperextended my brake lever in the process and would have to ride the rest of the day with my finger on the front brake so that I could reach it when needed. Sketchy. Luckily Shimano was there for race support and my brake was fixed and ready to go for the next stage. Thanks Shimano! The enduro was fun, but my favourite part of the day was when I set the pace for 20+min along some fire roads. Initially there were a lot of guys with us and then we caught and passed another group of 5, but by the end it was only Maghalie who was still on my wheel. I was proud and she was fired up. With 6 km to go we reeled in Lea Davison and rode in with her for a 3-way tie in the women’s secret raceJ (most women were racing solo, but you know we all like to be the fastest girl!). that is we rode in together after going off course together and crashing together on a blind corner where Magh’s handlebar actually went between Lea’s tire and frame! 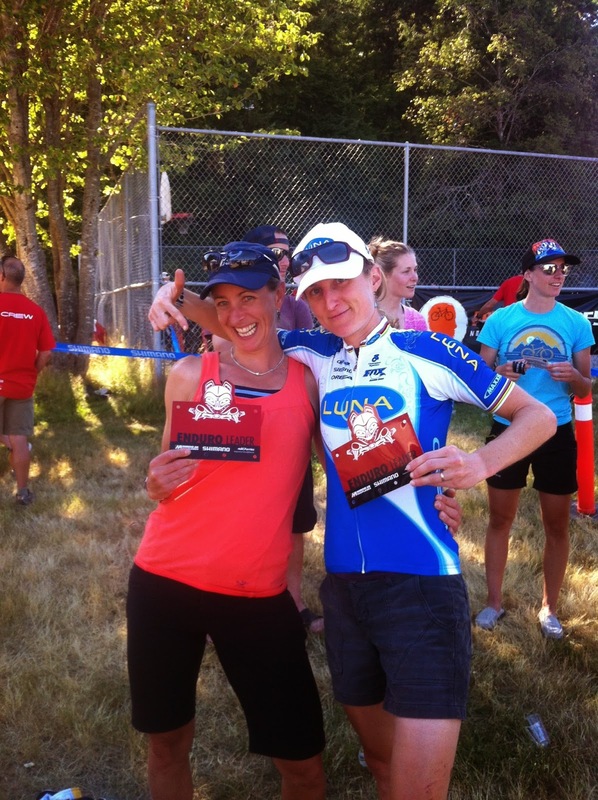 Wendy Simms was unbeatable on the day taking the win. Day 3: Another Ferry and a whale sighting later we were in Powell River. This stage is less climbing intensive, but heavy on the flat to undulating rooty singletrack. After 7 year’s of helping me Dial in the Fox Suspension on my Orbea’s for BC riding my husband Keith (our race support for the week) had Magh’s Orbea Oiz tuned perfect for her and after her asking “how do you ride roots fast” her already good riding really started clicking. Being Canada Day there were lots of crazy fans out on course. It is pretty surreal to be winding through single track, across bridges and then to pass Hawaiian dancers and Sasquatches on a hillside. Day 4: Hump Day, should be called survival over steep power line climbs day! Another Ferry ride to the Sunshine coast and we were lined up at the Ferry terminal exit to race straight up a hill and into fire roads for a long time! The road to trail ratio of this stage is a little off, but we are going point to point, From Earl’s Cove to Sechelt” and have to earn our way. It was hot, but an Ocean Breeze, our Camelbaks and that lovely watermelon aid station kept us cool. It was our longest day at 3.5hrs, but a good day. Day 5: Maghalie asks if I want to try winning today. Atta girl! We are winning the women’s team race ahead of Leslie Tomlinson and Gretchen Reeves, but like I said we girls like to be the fastest girls. Starts are kinda crazy as we try to keep track of each other amongst the other racers while going as hard as we can, but not so hard we lose each other. We raced a great race, being in the mix all day with Wendy Simms and Kim Hurst, Lea Davison having gotten off the front early. Amazing single track deposited us right at the Langdale Ferry where our shower trucks, Bike wash stations and food vendors awaited us. Hanging out with all the other girls after the race Maghalie starts unpacking the gear from her Camelbak. It includes and emergency blanket and flashlight among other things. We figure we can lighten her load for the last two stages! Day 6: Squamish, one of my favourite places to ride. This close to the end I can see Maghalie is feeling more confident that she can finish the race strong and I have figured out my pacing so we race more smoothly as a team. I pull fire roads setting a good pace, but giving a draft and she leads the trails so I don’t have to guess whether making a pass will separate us. Leading, it can be too easy to go too hard or too slow for race pace. Soon enough we had caught up to Lea and had fun riding with her for several km, then on the fire road up to the enduro I looked back and it was only Maghalie on my wheel and no Lea. We both saw the opportunity to lead the race and gave our best to the very end. It was actually really emotional to see how far we had come as a team through the week as we came into the finish line. My teammate that had been racing hard all week, just found another gear. Confidence is a beautiful thing. 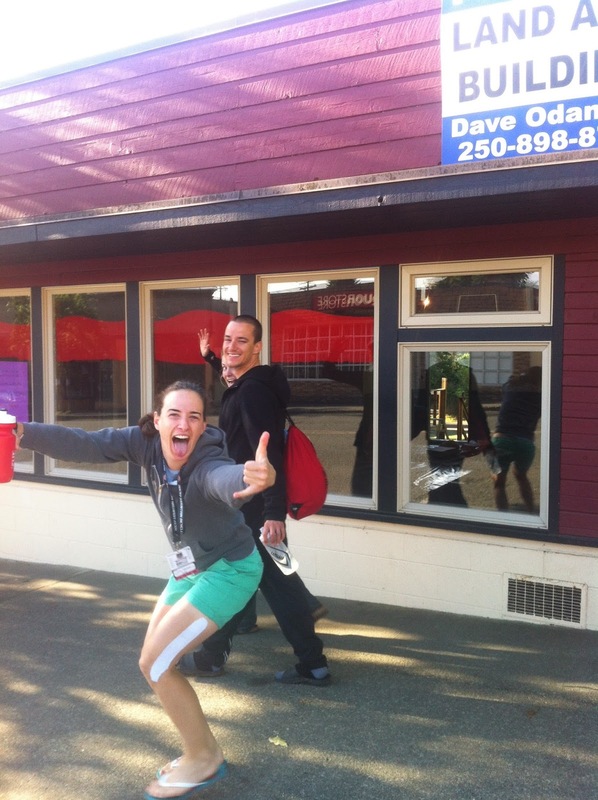 We were pumped with our legit and secret victories and headed out for a good sushi Dinner in Whistler with her boyfriend/coach David and her Dad Reg also doing the race as a team as well as Lea and her Dad. Day 7: Whistler. Day 7 and a short day! Only 20 km to pin it and Maghalie was game. We climbed well into the top 30 overall on the long opening climb and held it to the finish. I was so impressed with Maghalie, digging deep and going so fast on the last day. As we descended the final single track with her leading, it was rewarding to her people go “Wow”. We had done it. We had raced 7 tough, fun days and come out stronger, No team divorce all smiles. 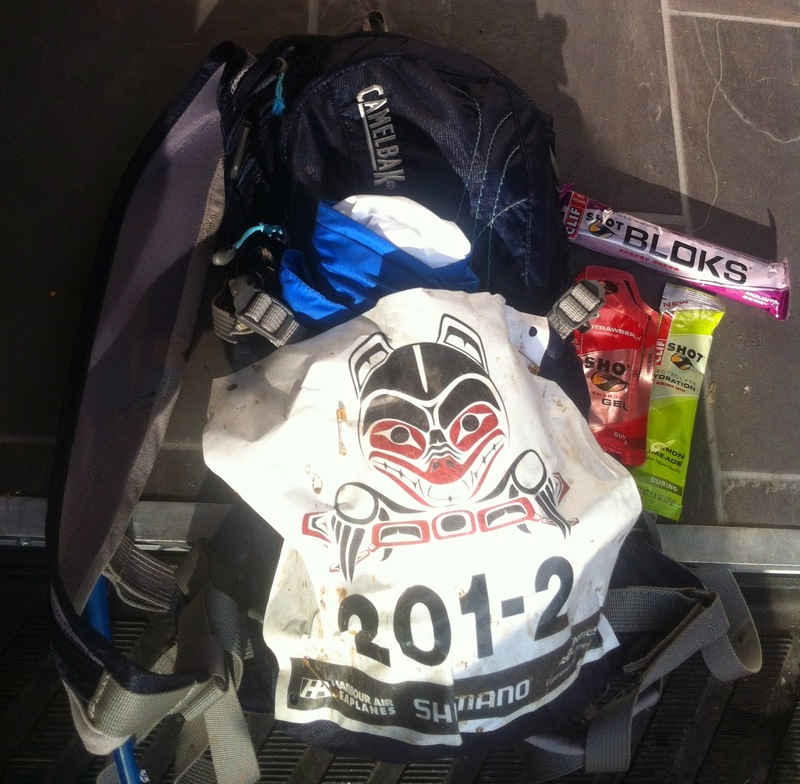 Thanks Maghs for being an awesome teammate, Keith for the race support, Luna, Clif and Camelbak for the fuel, Orbea, Fox, Shimano, Maxxis for the smooth ride, Champion for all the needed Lycra and Oakley for protecting our eyes through the more rural areas! Finally thanks to all the 128 full time volunteers, local volunteers, staff, fans and the other amazing people and racers that make BCBR such a great experience. I really recommend checking out the BCBR videos and site. It’s a pretty cool bucket list adventure. 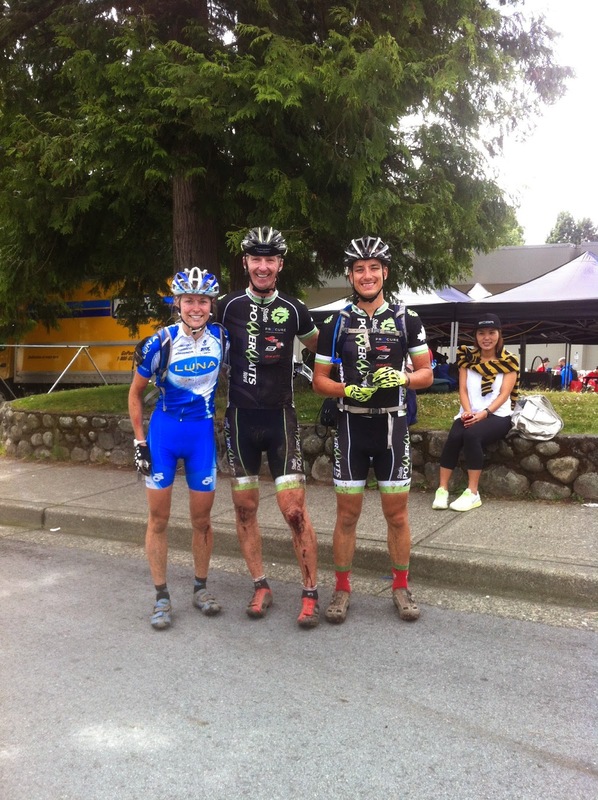 Oh yeah, and I won the enduro:-), Wendy Simms 2nd, Emelia Thy 3rd.